The key to this dish is homemade chicken broth, preferably from organic chicken (see recipe below). Don’t let the long list of ingredients deter you from making this wonderful detoxifying, healing soup; the taste is a flavor treat! 3 cups fresh pineapple, rough chop. 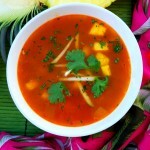 Place the rough chop pineapple and 2 cups chicken broth in the blender and blend well. Place a large pot over medium heat, add a little coconut oil, add the shallots and garlic, sauté until lightly browned. Add the mushrooms sauté until browned. Add the chili, curry pastes and ginger, stir a minute, add the chicken broth. Add the chicken broth, pineapple broth and lemongrass, bring to a slow simmer, and cook 10 minutes. Add the chicken, cook until just cooked through, about 3 minutes. Add Tamari sauce and fish sauce, discard lemongrass stalk. Divide into large, deep soup bowls and garnish with lime juice and zest, green onion, cilantro and basil.